We like black laptops. They're classy, and clean, and they always seem to carry an innate coolness that rainbows could only dream of. [firstpara] But then, what of psychedelia? And of techni-color dreams? Well then, buddy, why not take a look at the Sony VAIO E VPCEA35FG? As expected of VAIO laptops, the Sony VAIO E VPCEA35FG isn't one to shy away from showing its true colors. Style is subjective, but one can't help but admire the laptop's trendsetting aesthetics. Its gradient color scheme, and shell patterns are eye-catching as its clean, design lines are. The combination of those design choices really set the laptop apart from the flat color schemes, and flair-less exteriors of most other mobile computers. 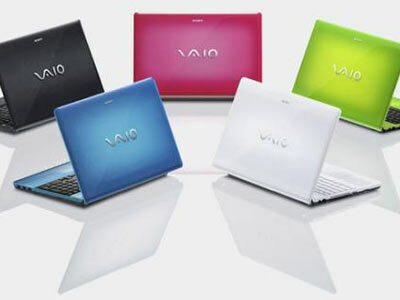 The Sony VAIO E VPCEA35FG is available in blue, green, white, pink (for your girlfriend or the wife), and black. Along with the laptop's desire to be stylish, Sony has also made improvements to usability. In spite of the laptop's lack of a rough and rugged appearance, it's still actually pretty tough. Techie.com.ph loved that the lappy's "chiclet style keyboard and glossy touchpad look and feel as though they’re built to last and would still look new even after a year of usage." It also has a certain heft to it, tipping the scales at 2.35 Kg. The Sony VAIO E VPCEA35FG also has the full set of ports you'd expect from modern laptops. It boasts USB 2.0, eSATA and Hi-Speed USB, LAN, VGA, and HDMI ports along with cardreaders for SD and Memory Stick Pro HG. A Motion Eye webcam for all you who require videoconferencing completes the package. With a price tag of P55,ooo, the Sony VAIO E VPCEA35FG surprisingly gives you enough bang for your buck in the performance department. It comes equipped with an Intel Core i3-370M 2.4 GHz processor, 4GB DDR3 RAM, which as any geek would confirm, are already pretty impressive specs. Specs like those work great for moderate to heavy tasks, and are perfect for the laptop's Windows 7 Home Premium 64-bit OS. With an ATI Mobility Radeon HD 5650 Graphics, and a 14-inch screen with a resolution of 1366x768, the laptop is a great gaming and multimedia laptop, as well. There are probably better laptops for gaming out there, but we're loving the VAIO E's performance as it is. For watching movies, the laptop offers a grade-A experience. Sony's experience in the HDTV industry really shows in the quality of this laptop's screen. Now, at its price, there may be other laptops out there with similar specs that come cheaper. But remember, this is a VAIO we're talking about. Yes, some of the VAIO models are admittedly overpriced. This one though, the Sony VAIO E VPCEA35FG is one of the better, more sensible offerings.